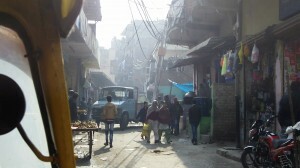 Under the cool rays of a sun struggling to warm an unseasonably cold Delhi, a four hundred year old settlement sprawls. Sarai Kale Khan hugs the ring road and yawns eastward in lawless warrens of three and four story tenement buildings carved with rutted roads and lanes choked with foot and motor traffic. It is home to two million people, a far cry from its roots as a caravan stopover. Some of its lanes, like the one we are on now, are barely wide enough for a car, let alone the truck chugging ahead of us. Indeed, the truck stops, blocking all traffic, and Sajji and I are unceremoniously informed our ride is over, we must get out of the rickshaw. For a few minutes, we are stranded on the ribbon of dirty pavement lined in ubiquitous ramshackle storefronts and homes in the day’s dim light. While we wait for our Save the Children India (SCI) contact to locate us, I am uneasy and on edge. There are a lot of hardscrabble men occupying the street. Several of them are generally loitering, others are going about their business. I’ve been in similar circumstances before, back when I visited Bihar in 2010 and 2012, but this feels different. Whereas in Bihar there was a look of curiosity and inquisitiveness in their eyes, the men’s gazes here hold something different. Maybe an undertone of malevolence? I can’t place it, but instead of rationalizing it away, I remain vigilant, scanning the landscape for makeshift weapons and escapes…and praying that SCI find us soon. My prayers are answered and before long we are found by Jennifer, a cheerful SCI associate whose presence immediately dispels the ominous undertone I’ve been feeling. Sajji and I have been just a few doors away from SCI’s center, and my relief is palpable as we enter its facilities. We are ushered through a set of double metal doors and I find we are in a tiny courtyard hub from which hodgepodge spokes of rooms dart in all directions. I am getting a Hansel-and-Gretel popcorn trail feeling, but realize popcorn won’t cut it as young girls, teachers, and various staff dart this way and that down the halls. This place is alive. We meet the director first. Standing about six foot tall and clothed in western style office casual, Neelam Matai is a commanding figure as she rises to great us, her voice like velvet as perfect English is spoken. Over a cup of heavenly chai (Indian tea), Neelam relates her journey to Delhi, to Sarai Kale Khan, to this place. Her story is extraordinary. While working with an anti-trafficking organization in Mumbai, Neelam becomes aware of a father who is abusing and trafficking his seven daughters. This wretch of a man has even named his daughters like post dated checks. Neelam rescues the daughters. While waiting for a train one day, she is approached by a man and the next thing she knows, she is waking up to a crowd huddled over her. The man punched her in the face so hard, she was knocked out cold and had to have three operations to fix her broken nose. Unsurprisingly, the man turned out to be the abusive father. Neelam pressed charges, and the guy’s current address is prison. After this incident, Neelam married and moved to Delhi. Wanting to continue her anti-trafficking work, she became aware of Sarai Kale Khan as a high risk area. She began to make visits and inquiries, and realized no organization was serving this migrant community. 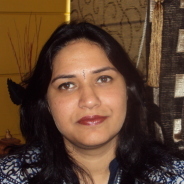 Having worked for SCI in Mumbai, Neelam hatched the idea to organize an SCI office in Delhi. That was seven years, and several hundred women and girls helped, ago. To speak to Neelam today, she has as much passion and resolve and energy to help as she has ever had. Her unflagging will and desire and caring for the Sarai Kale Khan women and community is inspiring and humbling. I want to be Neelam when I grow up.